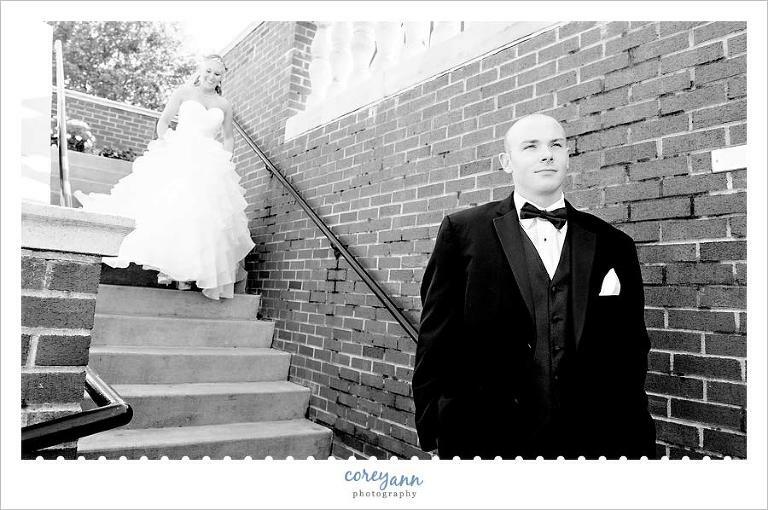 • This wedding was all about timing, much like their engagement session was! • The weather was daunting and luckily Ashley and Jeremy had decided to see each other before the wedding to get all of their pictures done so that they didn’t have to leave their guests after the ceremony. I love this whenever everything is at one venue because often it’s awkward to leave your guests to do a photo session while they are watching and waiting for you to be done. Originally the ceremony was to be outside with the reception indoors but JUST as we finished up the bridal party and bride and groom portraits there were sirens on the golf course signaling thunder nearby. We were able to squeeze in some family formals with the ceremony setup outdoors and quite literally just as we finished the rain started to come down – and didn’t stop until the reception began. 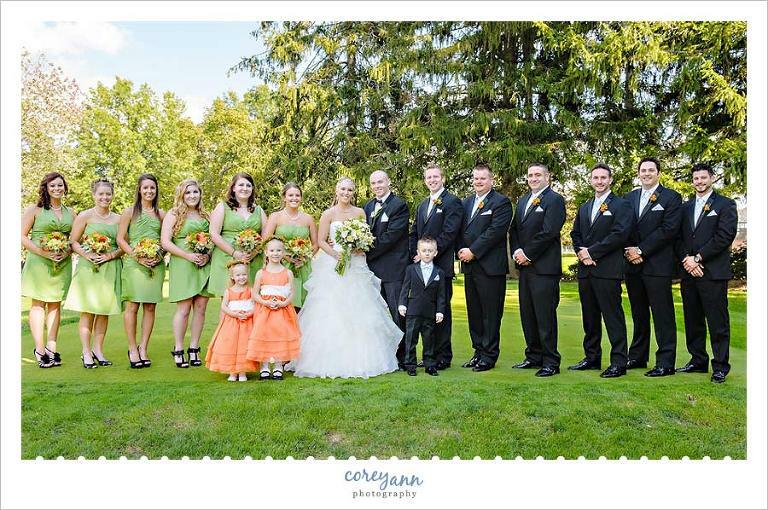 If they had waited to do pictures after the ceremony, they would have missed out on the beautiful grounds that Portage Country Club has to offer! • The sunset this night, due to the storms, was a-maz-ing. I was watching it during dinner and was trying to decide if Ashley and Jeremy would be OK with me interrupting their dinner when they came to get me to take pictures outside, perfect timing (again!). Since it was quite sunny outside, we opted to do their first look in a shaded stairwell and it worked out perfectly! 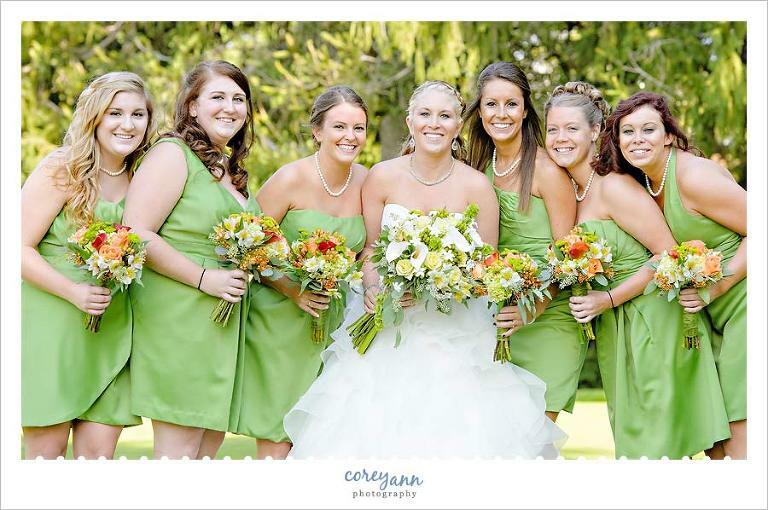 I loved the look of this bridal party, green and orange really look great outside! Such pretty ladies! You should know that I am a HUGE fan when everyone coordinates but doesn’t have the same dress, makes the bridesmaids more comfortable AND the pictures a bit more interesting. 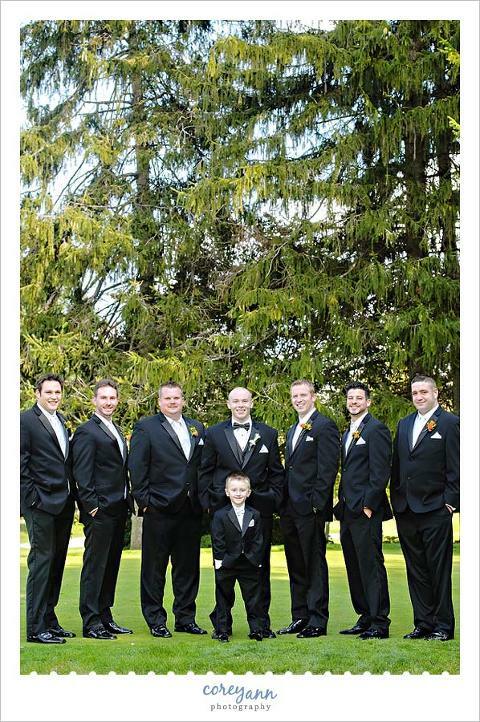 These guys look so dapper! These two!! SO STINKIN CUTE! Ashley’s bouquet was impressive… and big. SO gorgeous but this may be the largest bouquet I’ve ever seen. Here we’re finding out JUST how big it is. I love that these guys can go from laughing to nailing out this series pose in a second! Then they were able to start laughing again. This entire series makes me smile. The storms came in quickly and the staff moved like lightning to get the ceremony moved inside. When everything was inside and set up, the ceremony started and there were few dry eyes in the house. I love this image of Ashley’s Dad kissing her as he gives her away. The ceremony was full of tears and laughs and many smiles. This may be one of my favorite first kiss images ever. I think Jeremy is excited? Bouquet and beer. I like how they entered their reception! I love how he’s secretly getting her with some icing as she’s kissing the icing she got him with off his nose. Ashley’s son was talking during the blessing and they were quick to shh him, love! This picture makes me all kinds of happy. I love how the sun pics up on her hair! Jeremy had a blast with his friends! These girls were the first to hit the dance floor and were still rocking out when I left. Loved them! The first dance was lovely and sweet! Ashley changed into custom glittered bridal Chuck Taylors for the reception. I can’t tell you how awesome this was! Finally an adorable image of Ashley and her daughter as they hit the dance floor before I left. The baby slept for most of the day so it was fun to finally see her awake and having fun! Thanks to you both for having me along on your fun day!! !